The Polymer Research Technology Platform gel permeation chromatography (GPC) suite consists of eight GPCs running on various eluents equiped with a variety of detectors, including a PL220 for high temperature use and a bonus instrument for unusual conditions (i.e. ultra low or ultra high MW). Aquagel OH 40 + 60. These detectors and columns are flexible, and can be changed if requested. All samples for GPC must be filtered before running to prevent damage to the systems. 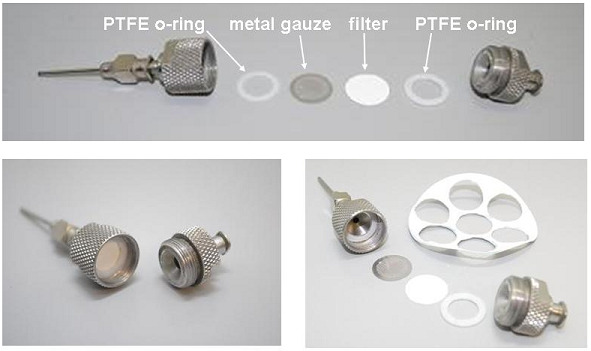 Filters should cut from the appropriate materials: Hydrophobic for CHCl3 and THF, Nylon for DMF and Hydrophilic for aqueous. To be working correctly the components must be inserted in the correct order, as shown below.